Roll Calls are a regular feature of family history sites. Photo: Mayflower passenger list, Bradford manuscript. Credit: Northeast Document Conservation Center. 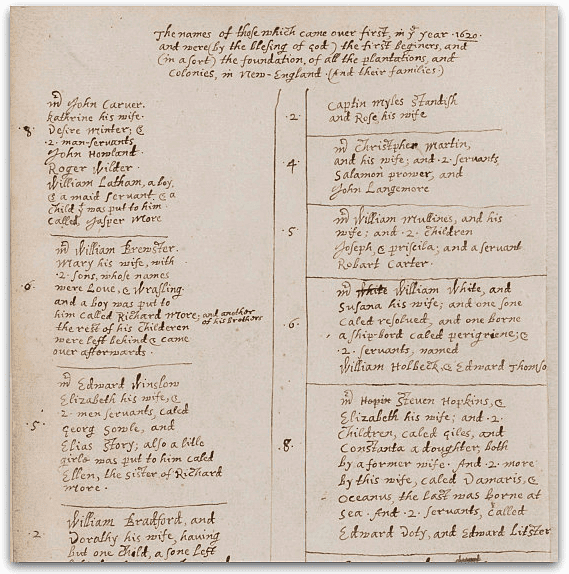 With the 400th anniversary of the arrival of the Mayflower coming up soon in 2020, let’s compare notes and see who your Mayflower ancestors are. Families have written about their Pilgrim ancestors for hundreds of years and their stories have been recorded in America’s newspapers. Here are just a few of the thousands of Mayflower cousins that I have found in GenealogyBank’s Historical Newspaper Archives. We’ve included the name of the newspaper and the exact page where you can find an article about that cousin. Please add your Mayflower lineage here and help us build a more complete record of all of the descendants of the Mayflower passengers.